No, I can’t fit all 180 days in before school starts again! During an interview, I asked a principal what he/she thought about SBG. His/her response was unfavorable, including that kids would have to figure out the system for each class and teacher. I thought it strange, since kids already do that. I was chugging along with SBG, following what a middle-school colleague had done, when I realized that I didn’t like that version. I needed something else. So, thanks to some Tweeps I’ve been stalking for a while really neat and well-connected people (I’m looking at you, @jmbalaya! ), I contacted Ramsey Musallam, and we chatted on the phone for a good half hour (in between his summer school robot building fun). I’m gonna give his SBG system a shot, and see what happens. It makes far more sense to me than the other version (at least, for my grade-level and subject). And I’d hate for the kids to be a part (again) of a class where the teacher isn’t comfy with the grading system. Posted in 180_Regeneration, Curriculua, Uncategorized and tagged 180blog, chemistry, sbg. Bookmark the permalink. I signed the contract for my new school and got a non-sub-ID! I’ve been working on and off on my new SBG curriculum. While I’m set on trying SBG, I’m now realizing how much I have to do and change from the stuff I already have. And what do I do with lab notebooks on the scale? @rawrdimus Wonder if I can translate this into lab notebooks. Hate them never looking back at stuff. 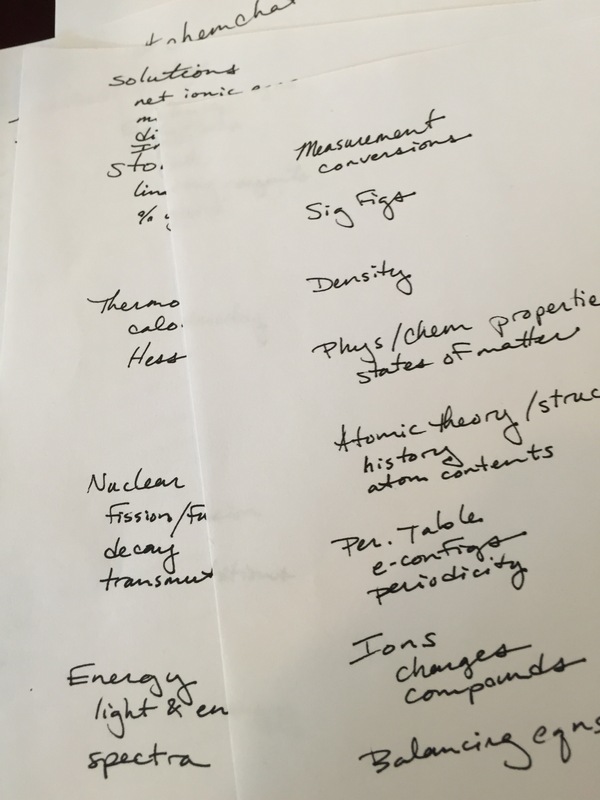 So how do I get students to use the notebooks after they’ve finished particular labs? So what it comes down to is… I’m feeling like a first-year teacher. Super insecure. I’ve got the job, and now I have to deliver all that I promised. I haven’t been in a normal classroom — my classroom — for eight years. I have scrounged a basic schedule from the school I worked at last fall, and I have all of my old worksheets (which need to be updated for my new SBG thing). I have tons of resources from other people, but need to make everything my own. Posted in 180_Regeneration, Curriculua and tagged 180blog, sbg. Bookmark the permalink. I have problems concentrating when I’m on my own, and yet, I usually get more done when alone. I twitch (being preoccupied with something and trying to not be preoccupied). Argh. Anyway. I’m hacking through the “I can…” statements. There are a lot of basic recall things, especially in the history sections! I need to change that up. I should also take a history of science course. I know there will be a lot of procedural/calculation requirements in upcoming sections, and I know I’ll need to change that up too. Posted in 180_Regeneration, Uncategorized and tagged 180blog, chemistry, curricula, sbg. Bookmark the permalink. I work better on paper than on computer, possibly because I don’t get into as many online games. At any rate, I’ve translated my digital notes into Evernote, so I can work on it while I’m away from my home computer. I’m having my annual self-argument about the order of subjects (start with measurement or atomic theory and nuclear stuff). The first way tends to weed-out kids who aren’t that serious about taking chemistry (strangely, because they don’t want so much math). This makes it better as a teacher, as most of the kids who hack it will probably manage to hack the rest of the course. There is a weird transition somewhere along the line, where numbers and sig figs aren’t used for a few weeks while atomic theory is introduced, and a lot of kids forget all rules for precision and numbers. The second way tends to keep a lot of kids in the beginning, but the course may be more than what they bargained for later. After getting the non-number-based stuff out of the way, the rest of the course needs digits and precision, so the math piece is introduced later and used consistently to the end. To me, it’s a much smoother way to do the whole course. And I hate weed-out things. And at the same time, I don’t want kids who shouldn’t be in the course… be in the course. It’s hard on them and hard on me. And maybe they’d be ready for chemistry at a different time, so maybe a weed-out is kinda diagnostic. And either way, I feel like a big meany, either for having put kids through an ordeal, or not having given them a chance to show me wrong. Because of my previous schools, I’ve done all kinds of ways to order chemistry, even starting in the middle. I’ve even done a bunch of versions concurrently. Ultimately, it needs to be what’s best for the kids, not me. I’ll probably change my mind tomorrow. Posted in 180_Regeneration, Curriculua and tagged 180blog, chemistry, sbg. Bookmark the permalink. Pouring rain and some hail make for a good day indoors. With last time’s list of topics, I started filling in the sub-topics. Perhaps I should re-do this: create a comprehensive list of skills/ideas/standards I want students to have, then divide them into topics/units. I think it might reduce the number of units for the year (rather than basically following chapter headings), and allow me to mix and match things more fluidly. I think I’m getting the hang of making the standards. It’s pretty indicative of the kind of teaching I’ve been doing (i.e., computing lots of numbers). I need to add more things to clarify understanding of concepts, which should help for students continuing in AP. I need to add laboratory components. What are the lab skills I want students to have? I think many of these will come in a “measurement” unit at the beginning of the year, but what other skills do I want later-part-of-the-year students to learn in lab (or is it mostly about what kids can get from lab results at that point)? Oooh… this is thereputic. I wish I’d given this a serious start earlier. As I tried to convince myself to not binge-watch TV and knit, I instead turned to YouTube to catch up on Hank and John Green. I really appreciate their honesty and dedication to better society with nerdfighteria and Project for Awesome, among other things. Friday’s video from Hank talked about education, and while the title of “Is School Broken?” is pretty provocative, he also doesn’t really give his opinion on the matter. He does, however, mention that he (and a couple other people I’m not familiar with) will be talking with President Obama on Thursday, and to tag any questions with #YouTubeAsksObama for him to get some ideas. I kinda went nuts, and Hank will probably stop reading before getting through all 23 things I tweeted, but there’s my morning. And then… text time. I’m finally reading “Classroom Assessment & Grading that Work” by Marzano. I’ve bookmarked and skimmed and/or read a lot of webpages and blogs, but I’ve needed to start at the beginning to create an SBG-based curriculum. Not super-riveting, and I’ll admit to skipping a lot of the justification-stuff at the beginning (I already agree! ), but this needs to happen. If nothing else, I’ll get practice with actually writing a curriculum again. Posted in 180_Regeneration and tagged 180blog, sbg. Bookmark the permalink.